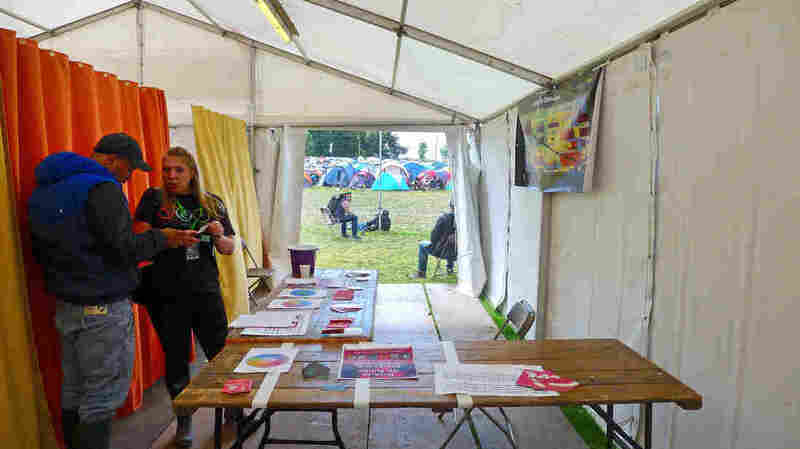 Making Sure Ecstasy Is Ecstasy: Volunteers Test Drugs At U.K. Music Fests : Parallels This summer, the first stop for many U.K. partiers will be a special tent where, without fear of arrest, they can get their illegal drugs tested for potency and makeup to prevent overdoses. 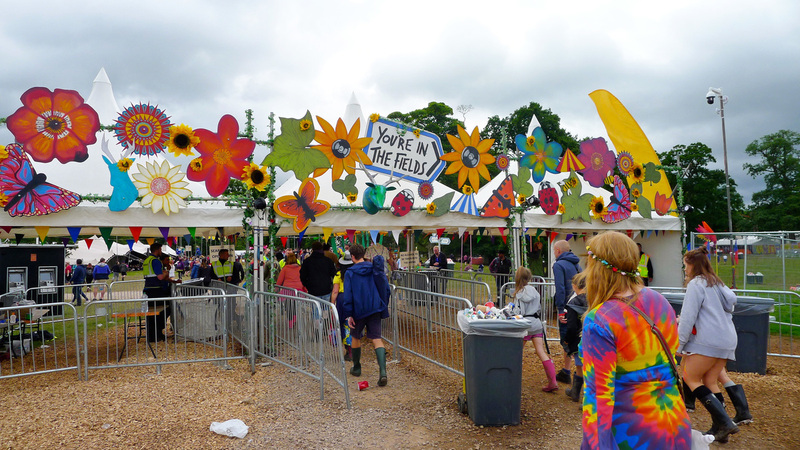 Festivalgoers file through the entrance to Kendal Calling, a four-day outdoor music festival in England's Lake District. For the first time, attendees can have their illegal drugs tested before they take them as part of a new project to prevent overdoses. In a muddy field in northern England's Lake District, more than 20,000 people are camping out at a four-day outdoor music festival called Kendal Calling. They jam along with their favorite bands. Some people wear outlandish costumes: There are superheroes, Indian chiefs and a naked guy wearing only transparent plastic wrap. There's dancing, drinking and occasionally, some illicit drug use. It's a typical scene at summertime music festivals across Europe. 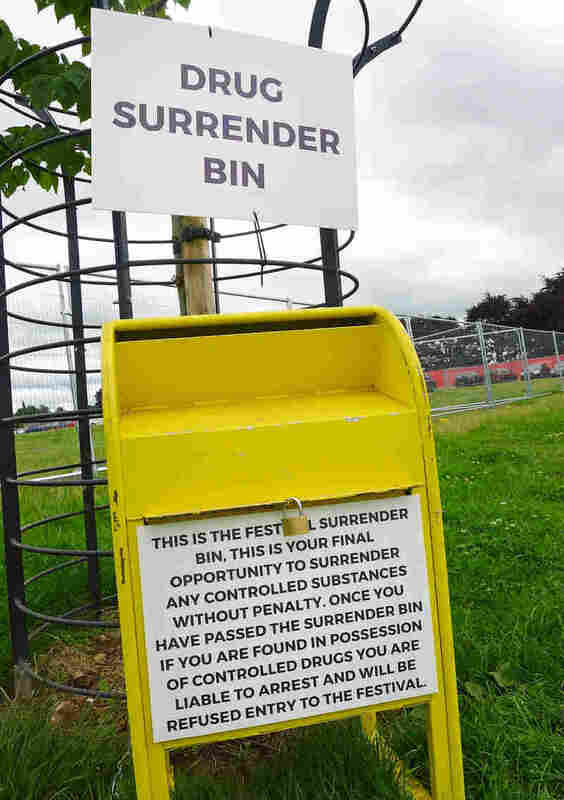 But in England this summer, for the first time, revelers can have their illegal drugs tested before they take them. It's part of a new project to prevent overdoses. "I've been doing festivals for three to four years now. I like my Ecstasy pills," says Rio Brown, 29, from Manchester, England. "If I want to chill out, I have my weed. If I want to party, I'll have some cocaine or a pill or whatever." So he and his friends take their baggie of drugs over to a festival tent labeled The Loop. It's a nonprofit that conducts forensic testing of drugs, and it's set up shop at U.K. music festivals for the first time this summer. "[It's] just to make sure we're getting the right thing, really, to make sure it's not harmful," Brown explains. "We don't want to kill ourselves, you know what I mean?" 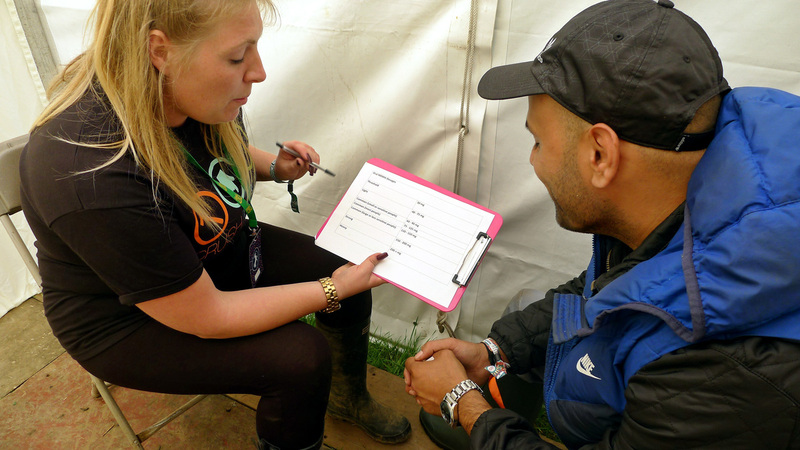 Rio Brown (left) gets advice from drug counselor Gemma Bennet inside a drug testing and information tent at Kendal Calling. 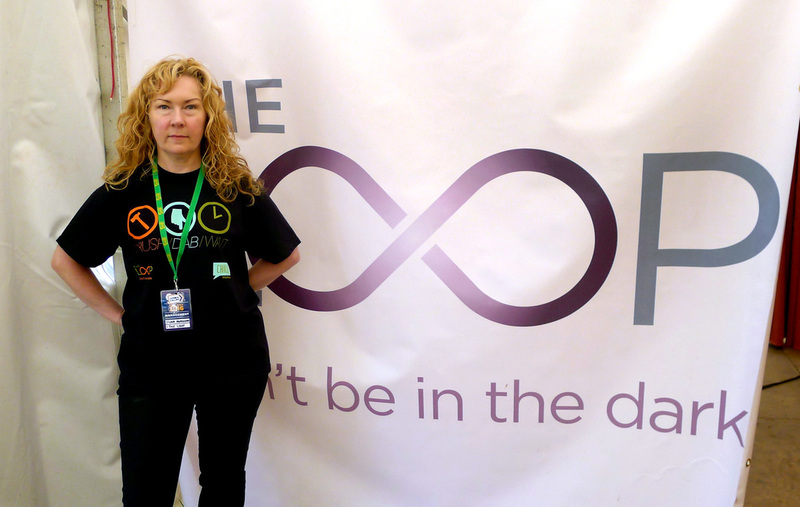 A nonprofit, The Loop, set up the tent to test partiers' illegal drugs before they take them. Brown breaks off a fragment of one of his Ecstasy pills and hands it to Chris Brady, who works full time as a drug counselor and educator for Britain's public National Health Service and volunteers on weekends with The Loop. "We're very realistic that people do take drugs, and what we want is to keep people safe," Brady says. "We don't want any mothers getting a call at 4 in the morning, saying that their son or daughter is ill, or even worse." In a tiny trailer behind the tent, volunteers conduct chemistry tests on pink and purple pills that look like children's vitamins. It takes only about 15 minutes. The volunteers are professional chemists, Ph.D. students and pharmaceutical researchers — all here on their own time. "They give us one pill or a small scoop of powder, and they won't get that back," explains Fiona Measham, co-founder of The Loop. "Normally the substance is destroyed in the testing process. So there isn't really anything left in our possession." Fiona Measham, a professor of criminology at Durham University, is an adviser to the U.K. government on drug policy and a co-founder of The Loop. That's how they get around drug possession laws. In the U.S., similar groups give out self-testing drug kits. But then Measham had an idea: Why wait until after the drugs are taken, to find out what's in them? Drug counselor Gemma Bennet (left) explains to Rio Brown the results of forensic tests on a fragment of an Ecstasy pill he brought in for evaluation at The Loop. "One of the key things is to win the trust of people who are giving us illegal drugs. This isn't an undercover police sting. Genuinely, it's a health and welfare issue," Measham says. "The police have been very supportive of that. So they don't stand anywhere near the tent. We don't want them to scare off potential customers." "We had some Ecstasy tablets that were 20 to 25 mg of MDMA, right up to 250 mg of MDMA. So you've got a 10 times range," she explains. "If people have two of the lowest strength, they probably would barely feel the effects. If they had two of the highest strength, that could potentially kill them." Behind a curtain, a drug counselor sits down with Rio Brown to explain what his Ecstasy pills are really made of. It turns out he overpaid. His drugs contain traces of MDMA, but also quite a lot of cellulose and chalk — harmless fillers. Brown decides to go ahead and take his pills. But The Loop says that about a quarter of people who use their service decide to dump their stash in the end.